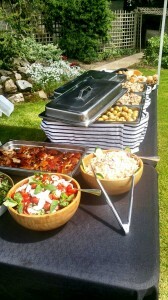 Are you looking for a Chester hog roast catering company? You will want a company with an excellent reputation, a catering business with plenty of experience, a team of people who have a real passion for good food and a drive to supply fine food time and time again. You need a catering business that are prepared to go that extra mile to deliver the very best, a business who takes pride in their work. You need Spitting Pig for your next hog roast Cheshire event. We can travel to any locality in Cheshire and provide you with an amazing feast that is sure to impress. We have a huge range of menus on offer for you to choose from so whatever you have in mind we are sure we can meet your requirements. Stand out from the crowd and provide the best catering for your guests. Hog roasts are more popular than ever and a good roast will go down a treat. It will be much more appreciated than a boring buffet which seems to be served as standard at many events. Poor quality food and an unimaginative menu can leave a bitter taste and make many guests feel disappointed. Make sure you and your event are remembered for the right reasons. Let us provide you with an exciting menu that tastes amazing. We support Cheshire farmers and use only the finest meats for your hog roast experience. Our side dishes, sauces and extras are also home made using the best products on the market to create fresh, tasty and unbeatable food. Our hog roasts can really make an event an extra special occasion. The hog being slowly cooked to absolute perfection for everyone to see will certainly awaken the appetites of everybody present. The hog roast makes a great focal point for all to enjoy. A pig on a spit is the perfect winter warmer on a chilly night or the perfect treat to help you celebrate on a balmy summer evening. If a pig roast doesn’t sound like your idea of the perfect party feast then don’t worry as we can provide plenty of tasty alternatives, just tell us your favorite meat and we will roast it to perfection and serve the juicy succulent meat with the dishes you desire. Perhaps you want to give yourself and your guests a choice of meats on the day? That’s fine we are happy to prepare two, three or even four meat roasts for you to choose from. We are also experts in barbecue catering and can give you a professional barbecue full of meat treats as simple or as elaborate as you wish. Hog Roast Cheshire is dedicated to providing our customers with the exact menu that they want and brilliant food that everyone will enjoy. 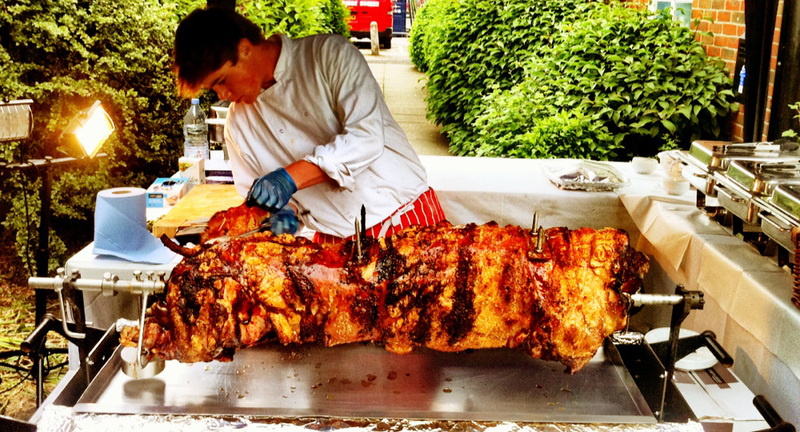 We at Hog Roast Cheshire, over the last 26 years have catered for hundreds of varying styles of events and functions from hog roasts in Knutsford to hog roasts Crewe, all of which have involved the use of the very best local ingredients cooked with flair and imagination. Introducing our latest innovation – hog roasting; we believe we offer an unparalleled package for your in-house or off site catering event. Yes, don’t be deceived by the name, for us it is far more than simply pork in a bun, we use the very best Gloucester old spot pork reared only ½ a mile from our award winning country pub and restaurant – we roast the hog slowly producing crisp succulent meat, probably the best pork you will have ever tasted, and the hog roast crackling is addictive. We also roast whole lambs, and, sirloins and topsides of Angus beef, matured for 28 days on the bone by our house butcher Mr J Fitton and of course the renowned Goosnargh chicken, duck, can be spit roasted for your event as well, delicious! So if you want a Hog Roast Knutsford event or anywhere across the county then click on the contact us section to receive your free quote within the hour.